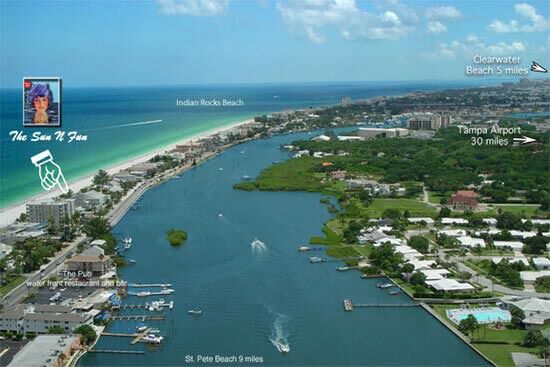 Historically, the most beautiful spot on the tropical barrier islands of Tampa Bay between Clearwater and St Pete. The large home and carriage house are now converted into 6 Gulf front suites featuring full kitchens, pillow top beds, and fantastic views. 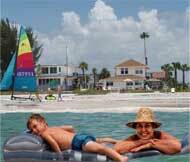 Awarded one of the highest scores on the beach by Superior Small Lodging. Kids love an old place surrounded by water. We are small and personable. Apt #6 is roomy 2 bdrm + sleeping porch, 2 bath and sleeps 8. 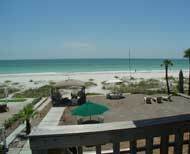 Apt #4 is romantic 1 bdrm upstairs with French doors and 9 windows overlooking the Gulf. Family reunions welcome up to 22. Complementary WiFi all the way to the beach! Site Map © 2019, Sun N Fun Beachfront Vacation Rentals, Inc.